Red Knockout Rose is a single flowering shrub rose. 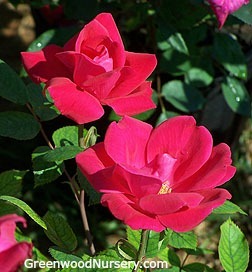 This is the 1st choice for a low maintenance, disease resistant, red shrub rose. The Single Red Knockout rose was designated as the 2004 ARS Members’ Choice by the American Rose Society. An amazing feature about Knockout Rose bushes are the outstanding blooming capabilities. They blooms profusely from early spring to the last frost in late fall. In mild areas, such as zone 7, Knockout Roses often bloom as late as Thanksgiving. Knockout roses even thrive in humid climates where most other roses need spray and maintenance and is also extremely winter hardy, even in windy areas, from zones 4 -10. When planted early in the season, new plants produce impressive, repeat blooms the first year. It matures as a well-behaved shrub up to 4 ft. x 4 ft. The dark purplish green leaves, as well as the blooms, are so tough they actually resist Japanese beetles. The Red Knockout Rose foliage turns an attractive burgundy in autumn. Orange-red hips last into winter and are attractive to birds. Our Knockout Roses ship in one gallon size containers. This thorny shrub makes an excellent rose hedge for privacy. The single red knockout rose is not currently available. Please order the double red knockout rose instead. Our Single Red Knockout Roses ship as well rooted one gallon container grown plants.